L et’s face it: The US men’s national team’s failure to qualify for this year’s World Cup in Russia is a big fat bummer. Still, that’s no reason not to jump on another country’s bandwagon -- the first-round matches kick off June 14 and run to the 24, so you have a solid 10 days to pick your new favorite team before the competition really heats up. 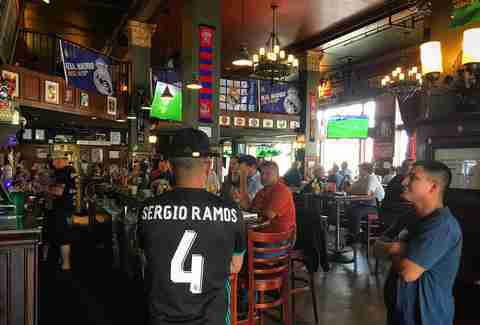 Most of the games will be in the morning and early afternoon hours, and there are a slew of soccer-friendly bars in Denver that are ready for your business. After all, there’s nothing quite like skipping work for a game and pulling up a barstool next to a dude who has no idea what the rules of soccer are -- all in the name of day drinking, bonding with a fellow citizen and, again, not working. Also, to help out ever more, we asked John Strong -- the lead Major League Soccer voice for FOX Sports -- to give us a couple of his favorite places to watch. Without further adieu, here are the most fun places to watch the 2018 World Cup in the Mile High City. This Colfax tavern bills itself as a “World Football Pub,” and on that front, it does not disappoint. The cavernous space plays host to all manner of soccer all year long, so you know they’re gonna bring the ruckus when the World Cup rolls around. Three Lions will be open for every game, “even the ones at 4am,” says a British bartender when reached by phone. There will be an emphasis on the English side, here (“The Three Lions” is the nickname of the squad), but the bar -- which serves pub grub standards like bangers & mash alongside Indian-style curries and Fuller’s drafts -- expects big crowds for Peruvian and Spanish matches, too. The bottom line: Every single match will be played, quite the boast with some of these start times. John's Pick. The uninitiated may be somewhat confused by the assemblage that is the Atomic Cowboy, a bar that is quickly expanding throughout the Centennial State. (Colorado Springs: You’re next.) In the morning, an arm of the kitchen serves Denver Biscuit Company’s decadent, well, biscuits while the afternoons and evenings -- and late nights -- welcome the house’s other specialty: Fat Sully’s pizza slices that are bigger than those dogs annoying famous people carry around in their purses. Atomic Cowboy will open early (8am early). 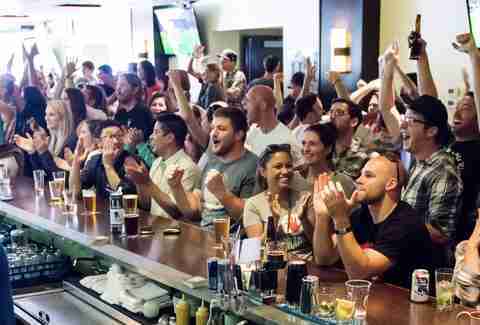 That’s great news for soccer fans and, while the bar probably won’t pop the sound on, the staff is always cool putting on any sports game a patron requests. Just one thing, though: Good luck making it through a whole match without having to take a nap after eating one of the aforementioned biscuits. 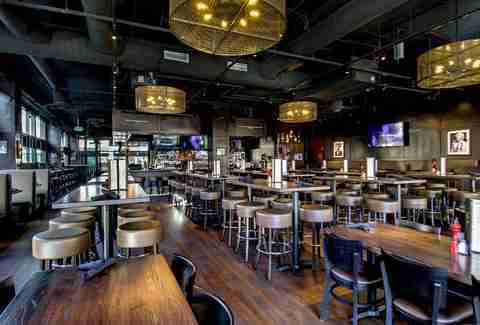 The Bulldog, which is managed by the same group as the Three Lions, is the other big football (read: soccer) bar in the Mile High City. It will also be showing all of the World Cup matches, regardless of start time. They’re even decking out the, uh, deck with a slew of TVs for an outdoor beer garden vibe. The menu skews British, of course, but also boasts some Pakistani dishes. 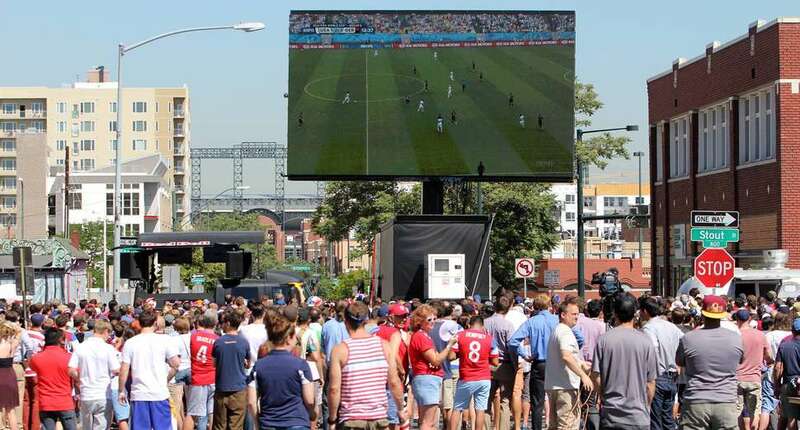 Best of all: The British Bulldog will host an outdoor, big screen, shut-down-the-street block party for the third-place and championship matches. Thirsty Lion bills itself as a “gastropub,” and the food is pretty good! It’s a chain, so that’s what you’re dealing with here. The two locations are showing games during regular business hours and, considering that they open at 11am, that pretty much means the noon games. Russia is far away. These game times are not optimal. 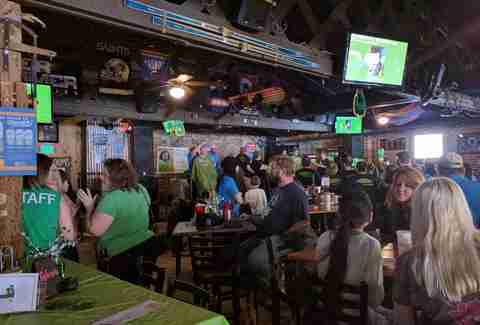 The Abbey has been the longtime home of Liverpool Football Club watches, but that doesn’t mean the Irish pub doesn’t bask in the glow of all things soccer. Because of Liverpool’s big Champions League championship match, the Abbey was still developing a World Cup strategy at the time of publication. It’s likely the Colfax bar won’t be open early for knockout round matches but will do so as things get more interesting in later rounds. Bonus: The Abbey always has at least two drink specials happening, no matter the hour. Rhein Haus is a celebration of all things Teutonic, from sausages and steins to... uh... bocce ball. Anyways, this is a German bar. Rhein Haus (and its sister bar next door, Wally’s Wisconsin Tavern) will be home base for all the Germany matches. They’ll be showing all of the defending champs' matches, no matter the time. If you think 9am is too early for a liter of lager and a pretzel, then you will have your German ancestry revoked by lederhosen-clad staffer. Well, not really, but you get the point. The Celtic, recently enough, picked up stakes and moved on down the road to Market Street. 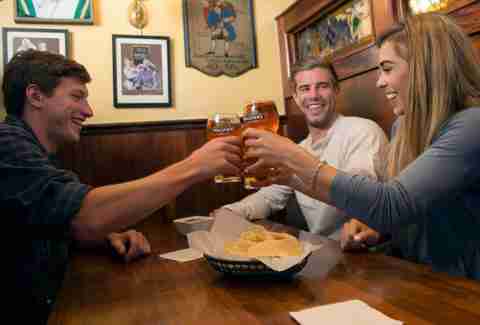 It’s an Irish pub with a twist: Off-track betting for the ponies. A staffer tells Thrillist that England and Iceland matches will be the main draw, here. Like many other bars, the Celtic will eschew some of the early morning early round matches before ramping into high gear for the later rounds. “Check Facebook” is a pretty good credo for most of these joints. A no-fuss sports bar with a chill vibe, Stoney’s shows just about every televised sporting match under the sun. The staff tells Thrillist that they probably will pick and choose some of the early-round matches and won’t show anything before 8am. The later rounds will be broadcast fully with Mexico being a big draw at the Broadway location. That’s right: A second Stoney’s now exists Uptown. Soccer will be televised there, too. John's Pick. Here’s the deal: Falling Rock “No Crap On Tap” Tap House has over 75 beers on tap -- and a ton more in bottles. 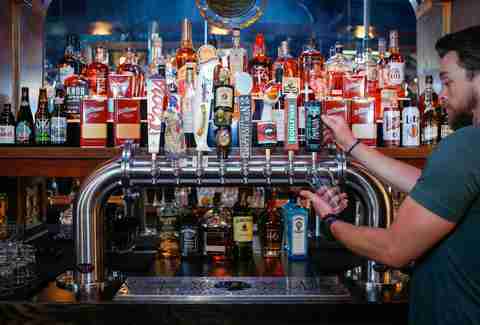 A LoDo institution, Falling Rock has long been known as the place to go for rare beer finds and a chiller vibe than most of the surrounding multi-leveled, bro-heavy sports havens. Just like most Rockies games, Falling Rock provides a beer nerd oasis in a sea of light beer-swigging tomfoolery. A staffer tells Thrillist that it’ll be airing many games that occur during regular business hours. The order of the day at this quartet of restaurants is readily apparent. “In Cod We Trust” is the motto for these battermen. That and... English football! Clearly the host’s faves, all locations will open early when David Beckham & Co. take the field. (Kidding. If you think David Beckham is still playing, heckuva job making it this far into a soccer article.) GB will play all other games during regular business hours. Here we have another Irish pub that is lamenting the fact that Ireland didn’t qualify for the World Cup. (Or, ahem, the United States for that matter.) 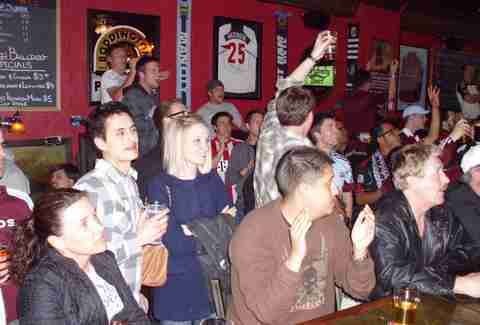 Pay no mind: The Snug will still be ramping into high gear for the Cup. The Guinness will be flowing and the TVs on both floors will be tuned to all the games during regular business hours. The Snug staff tells Thrillist that, as the World Cup progresses, they’ll determine whether or not to open for early matches. Stay tuned to its Facebook page for more. This ginormous sports bar in LoDo can always be counted upon to broadcast major sporting events. A Sports Column manager tells Thrillist that they won’t anything before 7am, which means many of the bigger 8am and 9am games will get aired here. Because it’s not a soccer bar, per se, expect most of the action to be during the later rounds. John's Pick. HTB has a slew of ginormous TVs situated around its ginormous bar in its pretty ginormous, patio-featuring space. The burgers are -- you guessed it -- large. This 32nd Avenue spot reports that it’ll be featuring most of the games that are playing during regular business hours -- and some game replays, to boot. Check its Facebook page for a broadcast schedule. A Czechia bar on South Broadway. Have you not been here before? Gotta see it to believe it. Even though the Czechs failed to qualify for the Cup, Europeans support each other and this European bar will be showing many European matches. It’s hard not to make a “Czech Facebook” joke, here, so that’s what’s up. Colin St. John is a Thrillist contributor.